Over the last year or two, I’ve been craving Indian food more and more often. When I heard about the new title from Madhur Jaffrey, Vegetarian India: A Journey Through the Best of Indian Home Cooking , I was excited to add more Indian dishes to my rotation. By the time I arrived at page 15 of my review copy, I had already marked four recipes I wanted to try immediately. In this book, Jaffrey explores all of India and shares regionally distinct dishes from homes, cafes, and special occasions. I was interested to learn about the tradition of mushroom foraging in Coorg and how those wild mushrooms are cooked over a fire and dressed with chopped green chiles, lime juice, and salt. There’s also an introduction to the Marwari community made up of strict vegetarians with a revered cuisine that makes ample use of ghee. Jaffrey also writes about specific ingredients that she hadn’t included in previous books because they were difficult to find. Now, there are more Indian markets and online sources available to make including these items possible. One of those is poha or flattened rice, and it can be eaten with milk or yogurt or crisped and combined with peas and potatoes. It’s also sometimes made into a risotto-like dish called upma. It was a delight to learn more about this varied cuisine, and it inspired me to do a quick ingredient search at a local Indian market to get me cooking from the book as soon as possible. Two of the pages I marked right away were the one with Cabbage Fritters because of the crispy, frilly-looking patties made with strands of cabbage, chickpea flour, spices, peanuts, cilantro, and curry leaves and the page for Spiced Potato-Ball Fritters. There are also several okra recipes I want to try as soon its season arrives. I love the thought of tangy amchoor powder sprinkled on fried okra. The Eggs in a Hyderabadi Tomato Sauce looks delicious with the spicy sauce of tomato puree and tamarind concentrate. There are appetizers, dals, rice and other grain dishes, breads, chutneys and relishes, and drinks and dessert. First though, I had to try something from the Dals chapter, and I found most of what I needed on my shopping trip. 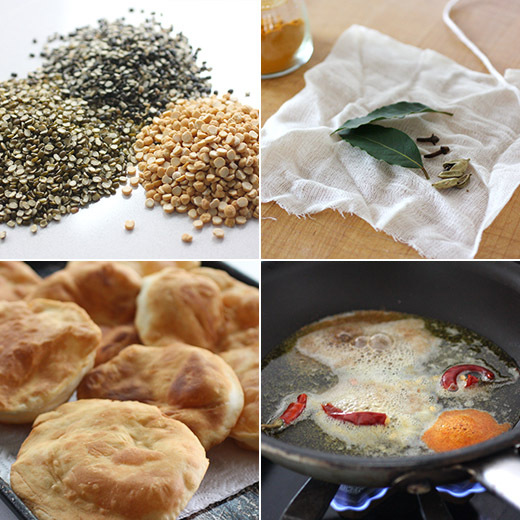 The Mixed Dal, Marwari-Style recipe includes four types of dal. I always have chanda dal on hand since I use it often for a different dish. And, I found split urad dal and split mung beans at the Indian grocery store. I wasn’t able to locate plain toovar dal, so I used a little more of each of the other types. The dals were rinsed and then left to soak for a couple of hours. Then, they were drained and placed in a large pot with water and brought to a boil. I took Jaffrey’s advice to place the bay leaves, cloves, and cardamom pods in a piece of cheesecloth and tied it closed. That made it easy to remove after the dal was cooked. Turmeric was also added at the beginning of the cooking time. Once the dal was tender and most of the water had been cooked off, salt was added and the dal was mashed with a potato masher. Last, the dal was flavored with a tarka which in this case was heated ghee with asafetida, cumin seeds, and dried red chile. The spice and ghee mixture was poured over the dal, the pot was covered, and the flavors were left to mingle. Before serving, the dal was stirred and fresh cilantro was added. A yogurt relish was suggested as an accompaniment, and I went with the Fresh Cilantro and Yogurt Chutney. I also made the Puffed Fried Leavened Breads. 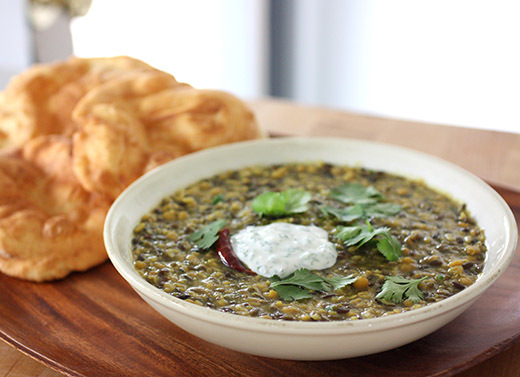 This thick dal is perfect for scooping onto breads as you eat it. I’m still not completely confident about choosing and mixing spices for Indian dishes without a recipe to guide me, but I love learning more all the time. And, dals are becoming a favorite comfort food for me. So, it’s great to have more recipes to try. I’ll definitely be trying more breads from the book too. My only disappointment is that there isn’t a recipe for naan in the book, but there are plenty of others to keep me busy. I predict I’ll be using this book frequently. So flavourful and satisfying! A great dish. i love listening to jaffrey speak--she always seems so knowledgeable and classy! while i don't love all the flavors of indian cuisine, this is obviously a tasty dish! I totally fell in love with your dish... Looks so tempting! I’m such a sucker for an indian cuisine ! I'm learning right along with you. I know so little about Indian cooking, rarely make anything myself and we have no Indian restaurants here, although there is a market. The book sounds marvelous and Jaffrey's talent is on display here. Must put the restaurant on my list for next NYC trip. If there is one ethnic food that I find overwhelmingly intimidating it is Indian food. I do have quite a few books to help me along including one of Jaffrey's but, for some reason, I just get so discombobulated and chicken out! You have done a marvelous job preparing this dish Lisa. You seem so comfortable with the ingredients. Hopefully one day I will take the leap! Love this recipe Lisa ! I am so unfamiliar with many of these ingredients---I need to take the plunge and add some more Indian dishes to my repertoire. 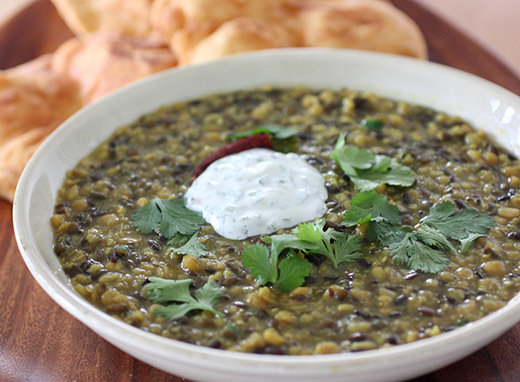 Your mixed dal sounds so hearty and flavorful, Lisa! Hi Lisa, last year I had my first real Indian dish and I have been hooked ever since. This sounds like a wonderful book, will have to pick it up.